Will Rahul Gandhi be able to woo the voters to bring the Congress back to power? The Indian National Congress party-the principal opposition in India launched–Ab Hoga Nyay, (Now, there will be justice) a political campaign that promises justice for all. Can the campaign harvest disenchantment of millions of voters in India against the ruling Bharatiya Janata Party and its Prime Minister Narendra Modi? 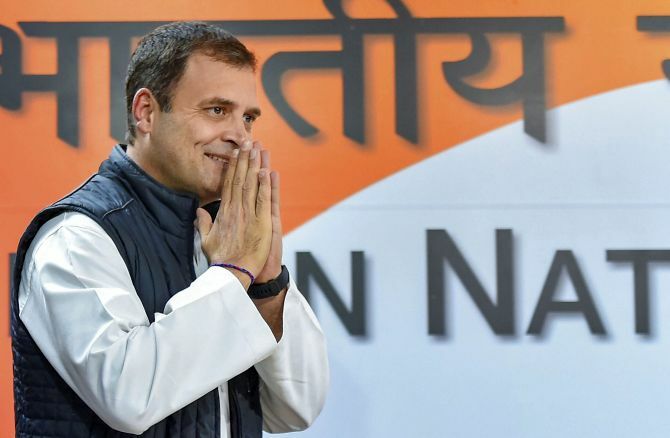 Five days ahead of the first phase of polling on April 11, the Congress party launched its slogan for political campaign for Lok Sabha polls-Ab Hoga Nyay (Now, there will be justice). The party is weaving a narrative around the “injustice” meted out to countrymen and “atmosphere of despair” prevailing in the country during the Narendra Modi regime. The tagline seeks to play on the Hindi acronym for the party’s Nyuntam Aay Yojana (minimum income guarantee scheme). “We are seeking justice or Nyay against the injustices committed in the past four years. Those who promised Acche Din (good days) only delivered anyay (injustice),” said Anand Sharma, chairman of the Congress Publicity Committee. The campaign focuses on justice. This word embraces all and it is not limited to the context of NYAY (the minimum income guarantee scheme promised in Congress manifesto). It promises justice to all, farmers, youths, entrepreneurs and for those who want a better future for their sons and daughters,” Sharma added. The publicity campaign, which comes after the release of manifesto that had the tagline ‘We Will Deliver’, is focussed on themes of justice for the poor, unemployed youth, farmers, women, Dalits and Adivasis, businessmen who suered the “badly executed” GST and for “each of us who have been lied to and taken for granted” by Modi government “whose time has run out”. On March 25, Rahul Gandhi announced the party’s big poll promise – INR 72,000 (USD 1040) annual income support for 20 pc of the poorest families in the country. “About 20 pc of the poorest families will be given an income support every year. All modalities have been worked out and this is possible within our budget. We have studied fiscal implications of the scheme,” Rahul Gandhi said. Gandhi’s announcement is challenging both Modi and BJP national president Amit Shah as the BJP’s fortunes began to look up after the air strikes in Balakot in Pakistan. Is it the Congress way of bringing the ruling alliance back to development narrative? The move by the Congress president is replica of what his grandmother and then prime ministerial candidate Indira Gandhi ahead of 1971 General Election coined the slogan, Garibi Hatao (remove poverty). Indira Gandhi returned to power winning 352 seats out of 545 seats with 43 pc vote share. Will Rahul Gandhi be able to woo the voters to bring the Congress back to power? More importantly will it stop the Modi-Shah juggernaut? India will know only after the ballot boxes are opened and counted on May 23 when results are expected to be announced.